When I emerged from the scene I knew boxes 4,5,and 6 were the three main spots revealed originally by the Lord that had to be removed from the Body of Christ. These must be gone from your life in order to stay in room three, which is the room for the guests in the Parable of the Marriage Feast. The scene reveals clearly we have no choice in the matter. From other information already given we also know people who stay in room three must be doing or at least understand Golden Meetings. I knew room one was for the Bride and that box number two, along with boxes 4,5,and 6, are all necessary to fulfill, to be able to rent room one. The scene again reveals we have no choice in the matter. I also knew box number two has in it many smaller round pictures already revealed by the Lord. He has referred to them as “elements." The main element I would mention here is “silence” because of the Lord’s Holiness, and the “mechanics of the intimacy” the Lord wants to have with His people. Remember, the guests don’t have the intimacy that the Bride has with the Lord, and He does not consider them to be a “One” person manifestation like the Bride. This is simply because they are not fitly joined together yet. The Bride is the manifestation of one body, made up of many parts all fitly joined together, operating at the direction of the Head which is Christ. It’s all a learned thing; silence and mechanical intimacy are learned things. God has continued to build a picture of silence and the importance of it in order to be in Him. As He revealed, it is because of Him being fully and truly Holy. The Lord wants us to understand because He wants this intimacy with His Bride. He wants all of us to grow up into Him. But speaking the truth in love, we may grow up into Him in all things, who is the head, the Christ. The following picture will help us understand more of the elements contained in box number 2 and more about the Lord’s Holiness, as well as the important picture concerning silence and intimacy in relation to a corporate body being able to be in Him as a single person, His Married Bride. The Lord said the reason for the silence is because He is Holy. The following is a record of how the Lord brought us into corporate silence, a “one body” silence! The Lord had told us what He was asking of us was hard and it has been as you will see. In the scene the group was seated out on the floor (audience with God) of a huge throne room. Around the edge were other groups behind the main floor (talking and doing their own thing - no audience with God). I saw our watchman get up and walk towards the throne - going up the steps to the throne for instruction. This scene made sense because in a King's Court the King has certain appointed people who can approach Him at any time. Not just anyone in the room can do this. 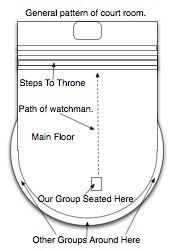 On 3-18-09, the watchman also had a scene of walking to the throne, which was further confirmation. In the scene she reported she backed away from the throne (after receiving from God), another example of the reverence required. In the next meeting, as all of us waited for the watchman to get the agenda, I caught a glimpse of the silence and the surprising “order” produced by one person receiving the agenda. Wow! (I remembered the Lord saying, ”I will have order in My church!”) No one of us was to ask questions, even for the agenda. (The watchman said that now she never asks for the agenda; it just comes in the silence at the will of the Lord.) We were to just focus on the Lord, listening and watching, nothing more. (God told a person who was having trouble being silent to listen with their mind.) Our minds were to be in Him, ready to respond instantly to whatever the Lord revealed. This is part of the mechanics of intimacy, to always respond in some way (with a few exceptions). It’s kind of like a conversation sometimes (always responding) and other times it is doing what the Lord indicates to do, always in thanksgiving and a grateful heart. One key is that everyone instantly responds as “One Body.” It should be noted that one person in the group doing their own thing, such as praying or asking the Lord a question, during “one body” silence doesn’t let the “one body” enter into Him. When the Lord started giving the watchman the agenda, we could quiet our minds from seeking or doing to just listening and watching. It helped cut out the clatter in the spirit realm. Nothing should be said or done except in response to the Lord because we are one in Him at that point. Does your hand argue or do its own thing? No, it does what you or your head determines without question. Grapeland TX, Begin with silence before the LORD, don't be presumptuous, don't cause a commotion. (This has to do with meetings.) Reverence through silence. I will speak to you what needs to be spoken, when it needs to be said. This is for all. I AM supreme. I AM in charge. It is MY meeting. Superstitious = your interpretations. Seek ME. It is the plain spoken truth. Reverence in MY sanctuary. Where is MY sanctuary? Where you meet with ME. You shall keep MY Sabbaths and reverence MY Sanctuary, I AM THE LORD, Leviticus 19:30. Holy, Holy, Holy, I AM THE LORD ALMIGHTY…. Using the three rooms of the temple God began demonstrating. He began showing us very simply (symbolically) you have to pass by the Altar of Incense to go into the Holy of Holies to enter into Jesus. The picture you and I need to understand is this: We have to produce this sweet smelling incense with silence in order to move into Jesus. It is the only way and there are no exceptions. On Wednesday, October 22, 2008 I had a scene in the night that revealed silence produces sweet smelling incense. I was inside a Quonset filled with single chairs and some people. From the silence inside there was sweet smelling incense going up to God through a long opening in the roof. I have pictured this on top, from the outside of the Quonset. The Quonset symbolically has to to with military, which has to do with warfare. I know God has used us militarily after meeting in Him, but I want to point out that the enemy does not want God’s people to learn how to meet in Him as a Married Bride. The intimacy the Lord wants to have with His people is something the enemy does not want to occur. 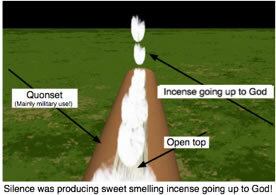 He will be trying to stop the silence needed for the sweet smelling incense to be produced in any way he can. It is a battle and it takes effort and understanding on our part! The silence surrounding the Battle of Jericho was a main element necessary for victory, certainly military. Remember also that the Lord asked me if I could be silent for three hours, if it was important. It's all about Jesus being on the scene and it takes silence. Have we accomplished this silence as a corporate single body? The answer is yes, but the Lord brought us to a place where this could occur. On 4-15-09, during a Kingdom Government Meeting we met in the Outer Court and I reminded everyone that we needed to work on silence and asked if there was anyone who didn’t think they could focus on this for any reason what-so-ever. After praying and everyone agreeing that they were ready we moved into into the Holy Place. In explanation, the Outer Court is the symbolic place for prayer and warfare for anyone being unable to focus. Problems at work or in the home might hinder one’s focus and would taint the “offering of silence.” It should be said that the silence has some sacrifice on our part, but we are not to think of it as a “sacrifice of silence.” It is an “offering of silence,” pure “one body” silence, that we want to produce on the Lord’s altar. We entered the area representing the Holy Place. 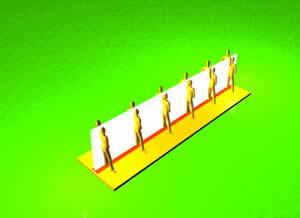 Early on I had a vision of this group lined up side by side before a wooden altar. We were all leaning forward in unison, placing an offering of silence on the altar. I knew something was up, but said nothing - hoping everyone would stay focused. In the Holy Place we circled up in a tight circle again, standing in silence and waiting to see if the Lord revealed anything. These particular silent times were not short, as we were intent on getting it correct. We then moved into the Holy of Holies, and on this night we circled tight for silence as one body, waiting on the Lord. Then the watchman saw the words “Give the silent sacrifices.” The watchman responded to the words and told HIM we brought a silent sacrifice & gave it up to HIM. The Lord said, “I accept.” Of course I was excited because I knew we had fulfilled the vision of all of us placing an offering of silence on the Lord’s altar, but knew not to say anything at that time. I hope this gives you some insight into the corporate responding required (the mechanics) for the intimacy the Lord wants to have with His Bride. Without these types responses the intimacy suffers and flow is hindered. For the most part responding brings forth the Lord’s next response back to us. Looking at, “I give you MY cloak.” - “That others may see & understand.” “DON’T TAKE IT LIGHTLY” leaves me with a hope that you, the reader, caught a glimpse of how much the Lord wants all of us to become His Married Bride and the intimacy He wants to have with Her. The Lord really does want to love on His Church, but He can’t, mostly because of her condition. She is harlotrous, doing her own thing her own way. He is Holy and He must be treated as such in a meeting in Him, with Him being the head. I knew the Lord had been quick to encourage us concerning having placed the “One Body” silence on His altar. Having been through all we have been through over the years concerning silence I knew it had never been done before as His Bride. I understood why the Lord said we had made history. We were very aware of the “Keep improving,” knowing it may have to do with the silence or even other elements required. Our Ministry Meetings are not “in Him” Bride meetings. We ask questions of the Lord and pray for people, etc. The “in Him” Bride meetings are now a combination of our 'old' prayer meeting and Oasis. The Lord told us to combine them and the meetings are referred to as Kingdom Government Meetings. We do however apply the elements of Brideship and intimacy principles where we can during our Ministry Meetings. It’s all about reverence and the fact that our King is Holy. 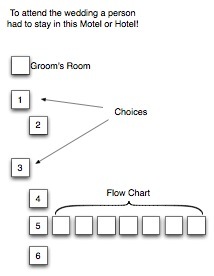 It is my hope that what I have written here helps everyone understand some of the elements of Box 2, the required box to fulfill in order to be able to stay in the Bride's room concerning the Wedding Feast. It is understandable that there are prerequisites to attending the Wedding Feast, either as a Bride or as a Guest. It’s all because of Jesus, His Holiness, and the fact that He is King. It is why the man in the Parable of the Wedding Feast was thrown out at the direction of God. He wasn’t dressed correctly. I think there is a clear ending message in the following; appropriate to a main element in a wedding feast meeting, being in the Bride or being there as a Guest.